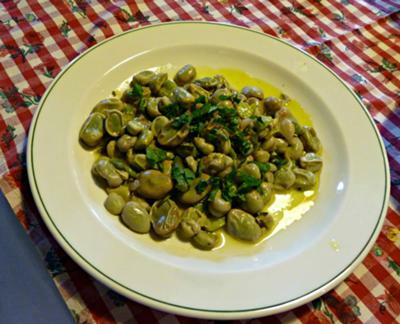 Here's a really traditional way of cooking Broad Beans. Many people hate broad beans as they can be very unappealing. For starters, they tend to go a horrible grey colour when you boil them and on their own, they can taste quite dull and uninspiring. This traditional Cypriot recipe makes use of fresh broad beans in season. Alternatively, you can use frozen beans instead, though it won't taste quite as authentic. First cook your broad beans in boiling water for a few minutes to soften the beans. Take care not to over-boil so that they turn an unappealing grey colour! Next heat the olive oil in a pan big enough to hold your broad beans and add the chopped garlic. Fry until lightly golden, then add the white wine vinegar together with the plain flour and stir until thickened. Add your broad beans and set aside for a couple of minutes to let the flavours infuse. You can add fresh mint for added flavour or more olive oil, black pepper, lemon juice and garlic for some extra zing. Do you also know how to cook Koutcha Xera if so can you or any one post I love to know. I remember eating this as a child but do not know how to cook them. Join in and write your own page! It's easy to do. How? Simply click here to return to Cyprus Recipes.